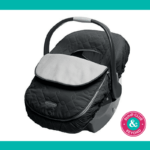 Car seats and car seat safety is an important topic here at Bump Club and Beyond. 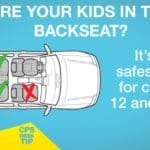 Car seat misuse across the country is greater than 70%, which is why we try so hard to make sure that as many people as possible know the rules of the road when it comes to child passenger seats and keeping your children safe. Keep in mind, most kids don’t grow out of their booster (and sit without a seat of some kind) until they’re 8-12 years old. Many of you have years until that happens. At Bump Club and Beyond we address car seat safety whenever we can—at our events, on social media and our blog. We were thrilled when the American Academy of Pediatrics (AAP) released their new car seat guidelines this week. They are very easy to follow. Bookmark this post and make sure you refer back to it when you have questions. BCB always follows the recommendations of the AAP–car seat safety is no exception. Here are the new AAP car seat guidelines. 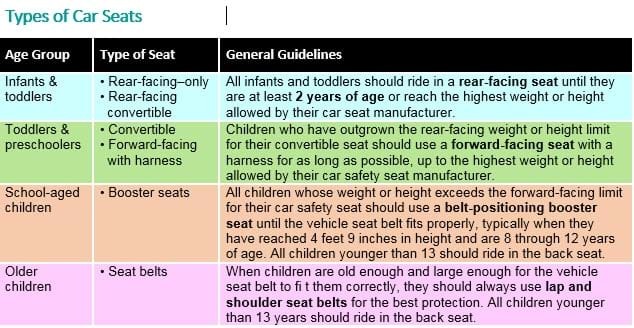 First, the new AAP guidelines starts with TYPES OF CAR SEATS in an easy to read chart based on your child’s age. Following this chart there is a description of the types of seats in each of these categories and their distinguishing characteristics. The AAP goes on to talk about proper installation, and in each instance, clearly states what we say over and over again at BCB events and online, “Always read the vehicle owner’s manual and the car seat manual before installing the seat.” Keep in mind your seat comes with its own guidelines–make sure you not only read the manual but register your car seat using the card that comes with it. This way, you will receive any notifications directly from the manufacturer if there is a recall. BCB’s Founder + CEO, Lindsay Pinchuk, said: My oldest is always arguing with me that she is “too big” to sit in a booster, or that she doesn’t want to sit in a “baby seat” any more. Per the new AAP Guidelines, it’s crystal clear now that a child should be in a belt-positioning booster until they are 4-feet 9-inches tall. Which means that most school-aged kids will be in a booster until the age of ten or eleven. They also made it clear that kids should ride in the backseat until the age of thirteen. Many of our readers are in the market for a car seat or booster at any given time. 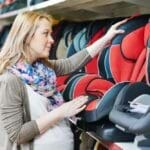 Check out the new AAP Guidelines as they have some great tips and do’s and dont’s for car seat/booster seat shopping. Again, this is a GREAT resource that we imagine you will refer back to time and time again. Bookmark it so that you can do so!